Mad Men review: Is it Don Draper's fault? Mad Men review: Is it Don Draper’s fault? 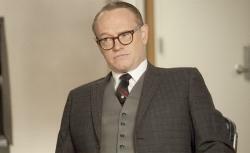 We’re gathered here to mourn the passing of the P in SCDP, dear old Lane Pryce—at the hands, let’s face it, of Don Draper. Only last week, we observed that the firm can be frighteningly indifferent to the toll the job takes on the lives of its employees. Lane transgressed, no doubt about it, and the steps Don took were correct, even humane, at least on paper. But as his fusty partner fell apart in front of him, the famously perceptive Don completely missed the real desperation on display. Don is gentle but firm, you might say, but there’s a fine line between firm and inflexible. Let’s not forget that just a few years ago, in 1960, Don’s no-exceptions excess-baggage policy and credo of reinvention drove another weak man—his brother Adam—to hang himself, as well. If you had to boil the philosophy of Mad Men down to a line—whether the subject is professional success, material lucre, or sexual conquest—this might be it. Happiness is overrated, Don is announcing. Happiness is complacency. And you’re quite right, John, that if the firm really wants the napalm account, they might have to cut loose this tortured Brit with tax problems who takes personal loans from the till. “Think of an elegant exit,” Don tells Lane. But what Don doesn’t grasp, when he makes his little pitch for existential reinvention, is that Lane is already living his second life. As he sits and drinks in his office, contemplating his fate as the snow falls gently behind him, a miniature Statue of Liberty stands by the window. We hardly needed reminding: Lane loves America. He may be out of step here, but he doesn’t want to return to England. He can’t. So he thinks of an elegant exit. Poor Lane, he can’t even get that right. (He should have used a Chevy.) So instead he opts for a prosaic one. “Everything you think is going to make you happy just turns to crap,” Glen says, in another contender for fortune cookie recap of the entire series. What did you two make of Glen’s reappearance? Perhaps it’s just the prep school accoutrements—or my excitement to see Moonrise Kingdom—but did it strike you that (speaking of reinvention) adolescent Glen has undergone his own gradual metamorphosis, and emerged as a Wes Anderson character? There’s something very Max Fischer about the winter-coat-over-jacket-and-rep-tie ensemble, the devotion to the Natural History Museum, and the interrogative greeting, “Are you using the lodge phone?” I also loved the throwaway moment when Megan, out of politeness, asks whether Glen would like something to eat, and he replies with a casual “If you don’t mind.” That combination of childlike entitlement and adult good manners is such an endearingly precise evocation of the age when you’re writing Nat Turner book reports. There was also something lovely (and Andersonian) about that final scene with Don. We’ve often described Glen, particularly in those early seasons, as creepy, and adolescence (and his Monday-morning moustache) have done little to dispel that surface impression. But there’s also something mystical about Glen—the plainspoken empathy that prompted Betty to forge an inappropriate connection with him because there was no one else who seemed to understand. It struck me that even though Don barely remembers this boy who is his daughter’s closest friend, Glen might be the perfect traveling companion. Of course, happiness will always be a perishable thing. But by surrendering the wheel and indulging Glen his simple wish, Don might see that it’s really all there is.